Russian lawyer, son of Feitel (Fadei); born in Kherson Sept. 2, 1861; received his education at the high school of his birthplace. He was graduated in 1883 from the New-Russian University of Odessa, which awarded him a gold medal and a prize for his treatise on the various kinds of landed property in Old Russia, entitled "O Formakh Zemlevladyeniya v Drevnei Rossii," Odessa, 1883. 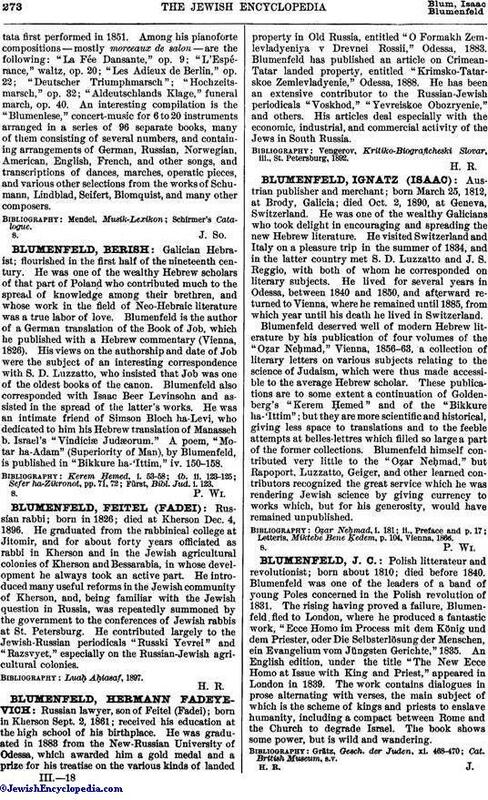 Blumenfeld has published an article on Crimean-Tatar landed property, entitled "Krimsko-Tatarskoe Zemlevladyenie," Odessa, 1888. He has been an extensive contributor to the Russian-Jewish periodicals "Voskhod," "Yevreiskoe Obozryenie," and others. His articles deal especially with the economic, industrial, and commercial activity of the Jews in South Russia. Vengerov, Kritiko-Biograficheski Slovar, iii., St. Petersburg, 1892.